During a difficult time for Disney, around the same time Oliver and Company was underwhelming audiences, yet before Pixar revolutionised the animated medium, it wasn’t as though animation ground to a halt. In fact, in some ways the pre-renaissance lull in Disney’s output was a golden era for rival studios like Fox and Warner Bros. And in particular, Don Bluth was the torch-bearer of high-quality animation. And one of the most well-remembered of his movies is this one, The Land Before Time. It’s The Secret of NiMH that really stamped Bluth’s presence on the mainstream, and it’s probably my favourite of his works. Steven Spielberg got involved for the remarkable success of An American Tail, and George Lucas got on-board too for this, a consciously ‘Bambi-with-dinosaurs’ project that hit the right buttons for mainstream success – kids love dinosaurs, animators can make spectacular volcanic landscapes and baby dinosaurs can even fill any movie’s cuteness quota within minutes. Rewatching The Land Before Time, it’s in many ways clumsier and less satisfying than the average Disney movie, but it does far more things right than it does wrong. The biggest success is making a core group of characters that are easily understood yet not completely flat, likeable but flawed, and easy to care about despite, well, being terrible thunder lizards. Littlefoot, Cera and the gang are still the benchmark for cute dinosaurs, far more so than those in Dinosaur or even The Good Dinosaur, even though those long eyelashes are just a little weird. The film succeeds when the kids are separated from adult influences, whereupon we largely get a series of character moments, which almost always hit the right notes. Cera being headstrong and clashing with Littlefoot while adorable little Ducky gets upset doesn’t break new ground but fleshes out its characters very neatly. Though Spike and Petrie are lesser characters than the others, Spike a mute, peaceful glutton and Petrie oddly adult in the group of small kids (a role probably meant for Bluth’s favourite Dom DeLuise, if he hadn’t been off voicing Fagin in Oliver and Company), but they fill out the group well. 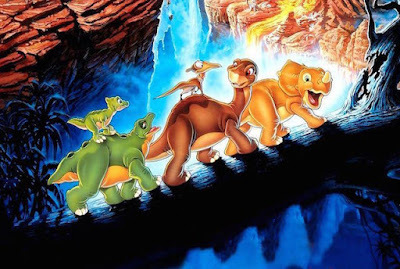 They also reinforce the central message of diversity – despite differences, but acknowledging different strengths and weaknesses, the little dinosaurs overcome the idea that ‘Three-horns don’t play with long-necks’ as they work together, something which I’m surprised wasn’t pushed home more at the film’s climax. Indeed, perhaps the weakest point of the movie is its ending. Yes, a goal is reached, there are happy reunions and it comes after an exciting escape scene, but there’s no real feeling of closure. The movie poises itself well to wrap up neatly, but it just doesn’t satisfy with its abrupt ending. What do Littlefoot and Cera do after this? Does Cera’s father change? What is said of Littlefoot’s mother? How does Ducky continue her interactions with the rest? It’s true that there are sequels to answer some of these questions – no less than 13 of the things – but I’m pretty certain their quality will not match up to the original’s, and little of the creative team’s original intentions will be apparent there. But certainly, this was a good piece of animation, and paved the way for All Dogs Go to Heaven and later Anastasia. What should be celebrated is the purity of vision of The Land Before Time, the innocence that just about avoid mawkishness and the lack of cynicism or self-conscious cleverness. It’s a simple message, delivered simply and with striking and often inventive visuals, and while there were parts that could certainly have been improved, particularly at the end, overall this was a very enjoyable, undeniably enduring piece of work.